My sister and I made this the other day and it is SO delicious! 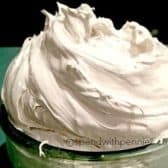 While it does take a little time, it’svery simple to make and tastes so much better than the store bought marshmallow fluff! With a whisk attachment, beat the egg whites and cream of tartar until foamy. Add 2 tablespoons of sugar and beat until soft peaks form, set aside. Meanwhile, in a saucepan, add 1/3 cup water, corn syrup, and 2/3 cup sugar. Cook over medium heat while stirring until the mixture reaches firm ball stage (instructions below) or 248 degrees on a candy thermometer. This step will take about 15 minutes. Once the corn syrup mixture has reached firm ball stage, turn the mixer onto medium and in a slow steady stream, pour the corn syrup mixture into the beaten egg whites. Once all of the corn syrup mixture has been added, beat on high for 5 minutes. Fill a glass with cold water and drop a small spoonful of the mixture into the cold water. Remove the mixture from the cold water and it should hold its shape, but quickly flatten.